Poster presented at the 2005 Meeting of the Freshwater Mollusk Conservation Society, 15-18 May, St. Paul, Minnesota. Abstract. Freshwater mussels (= pearly mussels or naiades) of the bivalves order Unionoida have a worldwide distribution, presently occurring on all non-glaciated continents. Estimates of global freshwater mussel species diversity have, in the modern era, ranged from less than 850 to more than 1200. Our census, to-date, suggests that the actual number is closer around 900 extant (or recently extinct) species, many with multiple recognized subspecies. Nearly 5000 species-group taxa have been described for the Recent Unionoida, and we have been working in collaboration since 2002 to vet the available taxonomic data and refine our estimate of the global freshwater diversity. While the order Unionoida is worldwide in distribution, the numerous individual species are not. 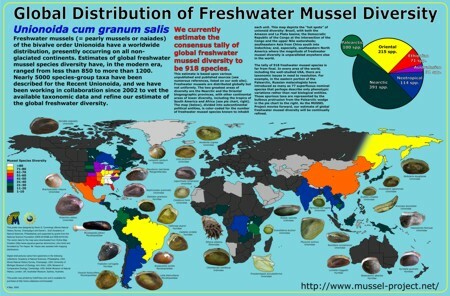 On a global scale, most freshwater mussel species are restricted to relatively few adjacent drainage basins, and almost none have ranges across continental boundaries. Nor are freshwater mussel species randomly distributed. Certain regions are apparent 'hot spots' of freshwater mussel diversity, most notably the southeastern United States and southeast Asia. To illustrate the global distribution of freshwater mussel species, we have surveyed the literature and museum collections to determine individual species ranges. These are depicted on a color-coded map of the world showing the number of species present in each country. This map is available on the MUSSEL Project Web Site (http://clade.acnatsci.org/mussel/).